Are you looking for an alternative to fast food? We all know how challenging it can be to get hot, well balanced meals on the table. Life can be so busy and made from scratch home-cooked meals can be very time consuming. Meals delivered right to your door can make a huge difference in your life. Whether you are looking for dinner for two, or you have a household in need of a 5-Day Meal Plan or a full week of dinners, we have options for you. At Send a Meal you can choose from a large selection of family dinners such as a traditional ham dinner, lasagna or even that all time favorite a Sunday pot roast. Research has proven that families that eat together lead lore productive lives. These meals and many more can be purchased individually or in a combination that is perfect for your freezer. I absolutely love the holidays. I love cooking, I love baking, and I love being with my family. And even though that time of year makes me so happy, I still find that cooking a holiday meal can be really stressful. There's just so much to take care of. But there are ways to make it less stressful. And one of those ways is to feel confident about every dish you're making. So let's talk about how to cook a turkey! There's actually a lot to know about cooking turkey - choosing the right turkey, choosing the right roasting pan, thawing, seasoning, brining... they all affect the meal you end up with. But for now, let's just focus on how to cook a turkey. There are 4 important things to watch out for when you cook a turkey. When you roast turkey, water evaporates from the meat. It intensifies the flavor, giving you a tastier turkey. But too much evaporation means a drier turkey, so you have to find a balance. Most people like a nicely browned turkey with a slightly crispy skin. You have to let it brown enough without letting it burn. When you cook a turkey, you have to take care of the drippings. They're the basis for your gravy. You have to let them cook enough at the bottom of the pan to become more flavorful, but you can't let them burn. It's important for the turkey to cook evenly. If the white and dark meat are done at the same time, you won't end up with a dry turkey! If you take care of those 4 things, then you're sure to end up with a great meal. 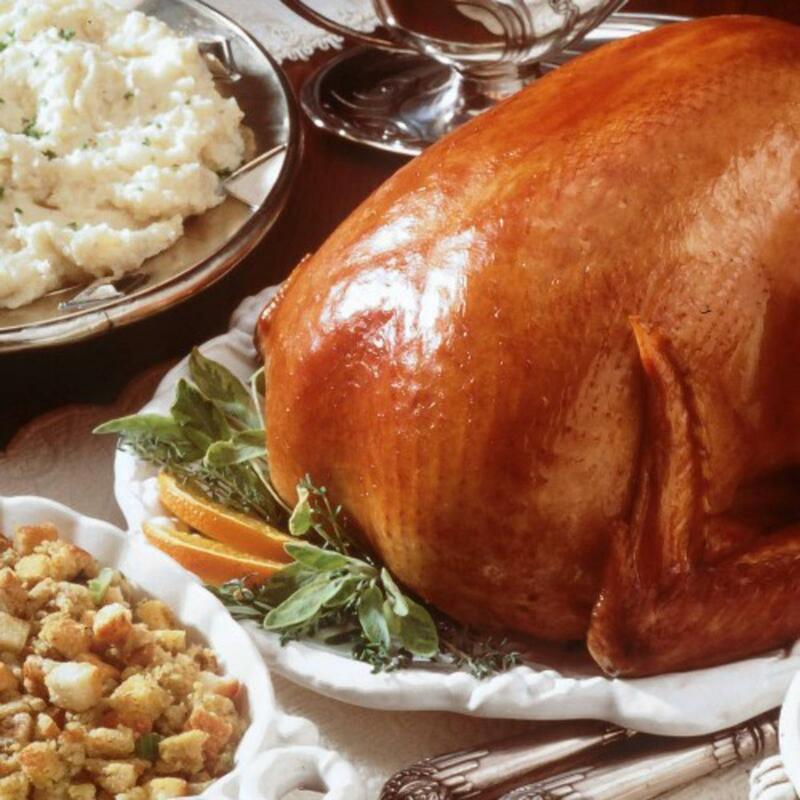 Here are a few things that'll help you learn how to cook a turkey perfectly. Set the oven to 325F. At that heat, you'll get great drippings, and the turkey won't get dry when you cook it. If you have trouble browning the skin, you can turn up the heat to 400F for the last 45 minutes or so. Covering the turkey with a lid can make the turkey cook faster, but it steams it. That means less evaporation, and a moist but bland turkey. It also means more drippings, but less flavorful ones. Foil helps deflect heat away from the turkey. If parts look like they might burn, covering them with a bit of foil will solve the problem. Using a rack helps air flow all around the turkey, letting it cook more evenly. If you want to be sure to have juicy breast meat, it can help to cook the turkey breast-side down for the first two thirds of the cooking time, and then flip it breast-side up. All the juices will flow down into the breast meat, keeping it moist. Just be sure you're able safely to flip a hot, heavy turkey. If you're not sure, don't. Better safe than sorry! Basting can keep the skin from burning, but it means opening the oven door. That makes the oven's temperature fluctuate, and keeps the turkey from cooking evenly. Adding a bit of butter under the turkey's skin before you cook it and using foil makes basting totally unnecessary. If your drippings are burning, you can just add a bit of liquid to the bottom of the roasting pan. And that's how to cook a turkey! If you just keep an eye on the turkey, and watch for and take care of these 4 things, you'll be a lot closer to a perfect turkey dinner.